Be the first to share your favorite memory, photo or story of Kathryn Weeks. This memorial page is dedicated for family, friends and future generations to celebrate the life of their loved one. Mary Kathryn Jones Edgerton, unexpectedly went home to be with Jesus on Wednesday, April 10, 2019 at Wayne UNC Healthcare in Goldsboro. Kathryn was born in Wayne County on March 15, 1936 to the late James Henry Weeks and Ella Mae Bowden Weeks. She retired after 30 years of service with O’Berry Center in Goldsboro where she served as a Dietary Supervisor. Kathryn was a member of Rosewood First Baptist Church and enjoyed being a part of the Gleaners Sunday School class. Her contagious smile and outgoing personality broke down barriers and opened doors to an exciting and fulfilled life. Kathryn dedicated her life to serving her family unselfishly and to serving her Lord. She will be missed and greatly remembered. The family will receive friends on Thursday, April 11, 2019 from 6:00 – 7:00 p.m. at Seymour Funeral Home followed by a service to celebrate her life at 7:00 p.m. in the chapel with Dr. Mike Collier and Rev. Freddie Langston officiating. The family will also greet friends following the service on Thursday and other times at her home. Interment will be at 10:00 a.m. on Friday, April 12, 2019 in the Princeton Cemetery. 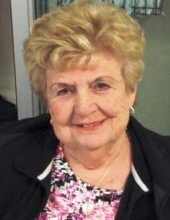 Kathryn is survived by her husband, Ben Ray Edgerton; children, Shirley J. Davis and husband Ronnie, Michael Wayne Jones and wife Lisa (whom Kathryn loved as a daughter), Gail Newell and husband Dale, and Eugene Jones and wife Beth; grandchildren, Christy D. Pearce, Joy D. Thompson, Robert Davis, Tammy D. Daw, Emily J. Lassiter, Jonathan Jones, Brooke Newell, Eric Jones, Bryan Jones and Brittany J. Byrd; and thirteen great-grandchildren. She is also survived by two step-children, Darryl Edgerton and Angie E. Chapman. In addition to her parents, she was preceded in death by her first husband, Claxton C. Jones and her son, James Phillip Jones. Online condolences may be sent to the family at www.seymourfuneralhome.com. To send flowers or a remembrance gift to the family of Kathryn Weeks Jones Edgerton, please visit our Tribute Store. "Email Address" would like to share the life celebration of Kathryn Weeks Jones Edgerton. Click on the "link" to go to share a favorite memory or leave a condolence message for the family.